Iran is one of the world's oldest continuous major civilizations. The history of Iran covers thousands of years. There are records of numerous ancient and technologically advanced civilizations on the Iranian plateau before the arrival of Aryan tribes from the north, many of whom are still unknown to historians today. Archeological findings place knowledge of Persian prehistory at middle paleolithic times (100,000 years ago). The earliest sedentary cultures date from 18,000-14,000 years ago. In 6000 BCE the world saw a fairly sophisticated agricultural society and proto-urban population centers. The south-western part of Iran was part of the Fertile Crescent where most of humanity's first major crops were grown. 7000 year old jars of wine excavated in the Zagros Mountains and ruins of 7000 year old settlements such as Sialk are further testament to this. Many dynasties have ruled Persia throughout the ages. Scholars and archeologists are only beginning to discover the scope of the independent, non-Semitic Elamite Empire and Jiroft civilizations 5000 years ago. At the end of second millennium, the Aryan nomads from central Asia settled in Persia. These are some of the civilizations in Iran before the Aryans: Neolithic civilizations, Teppe Sialk, Shahr-e Sukhteh, Marlik civilization, Luristan civilization, Mannaeans civilization, Kingdom of Jiroft, Elamite kingdom. The name Persia comes from a region in the south of Iran, called Fars or Pars in the Persian language. Persis is the Hellenized form of Pars, based on which other European nations termed it Persia. Eratosthenes however does make mention of the word "Iran" in his writings. This region was the core of the original Persian Empire. Westerners referred to the state as Persia until March 21, 1935, when Reza Shah Pahlavi formally asked the international community to call the country by its native name, Iran, which means Land of the Aryans but because of some Persian scholars' protests the government announced in 1959 that both Persia and Iran could be used. Iran became an Islamic republic in 1979 after the ruling monarchy was overthrown and the shah was forced into exile. There was much opposition against the Mohammad Reza Shah, and how he used the secret police, the Savak, to control the country. Strong Shi'i opposition against the Shah, and the country came close to a situation of civil war. 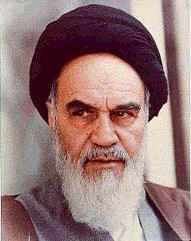 The opposition was lead by Ayatollah Khomeini, who lived in exile in Iraq and later in France. His message was distributed through music cassettes, which were smuggled into Iran in small numbers, and then duplicated, and spread all around the country. This was the beginning of Iranian revolution. 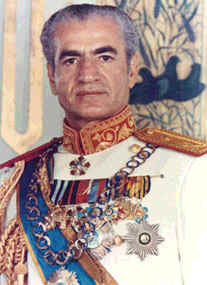 On January 16 1979, the Shah left Iran. Shapour Bakhtiar became the new prime minister with the help of Supreme Army Councils but he couldn't control the situation in the country anymore. Ayatollah Khomeini returned to Iran on February 1. Ten days later Bakhtiar went into hiding, eventually to find exile in Paris. Conservative clerical forces established a theocratic system of government with ultimate political authority nominally vested in a learned religious scholar. Iranian-US relations have been strained since a group of Iranian students seized the US Embassy in Tehran on 4 November 1979. U.S. President Jimmy Carter immediately applied economic and diplomatic pressure on Iran: oil imports from Iran were ended on November 12, 1979, a number of Iranians in the U.S. were expelled (some of whom were unrelated to the crisis or the new Iranian government), and around USD 8 billion of Iranian assets in the U.S. were frozen on November 14, 1979. 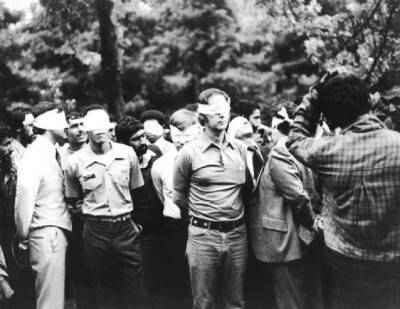 The Students held hostage 66 diplomats and citizens of the United States inside the U.S. embassy in Tehran. During the crisis, some hostages were released, but 52 were held until the end. After the presidential elections in 1980 negotiations between the U.S. and Iran resulted in the "Algiers Accords" of January 19, 1981, committing Iran to free the hostages immediately. Essential to the Algiers Accords and reportedly a non-negotiable requirement of Iran that the Carter Administration reluctantly conceded was Point I: Non-Intervention in Iranian Affairs. It reads "The United States pledges that it is and from now on will be the policy of the United States not to intervene, directly or indirectly, politically or militarily, in Iran's internal affairs." Other provisions of the Algiers Accords were the unfreezing of 8 billion dollars worth of Iranian assets and immunity from lawsuits Iran might have faced. On January 20, 1981, twenty minutes after President Reagan's inaugural address, the hostages were formally released into U.S. custody, having spent 444 days in captivity. The hostages were flown to Algeria as a symbolic gesture for the help of that government in resolving the crisis, where former President Carter, acting as an emissary for the Reagan administration, received them. During 1980-88, Iran fought a bloody, indecisive war with Iraq that eventually expanded into the Persian Gulf and led to clashes between US Navy and Iranian military forces between 1987-1988. Iran has been designated a state sponsor of terrorism for its activities in Lebanon and elsewhere in the world and remains subject to US economic sanctions and export controls because of its continued involvement. Following the elections of a reformist president and Majlis in the late 1990s, attempts to foster political reform in response to popular dissatisfaction floundered as conservative politicians prevented reform measures from being enacted, increased repressive measures, and made electoral gains against reformers. Parliamentary elections in 2004 and the August 2005 inauguration of a conservative stalwart as president, completed the reconsolidation of conservative power in Iran's government. 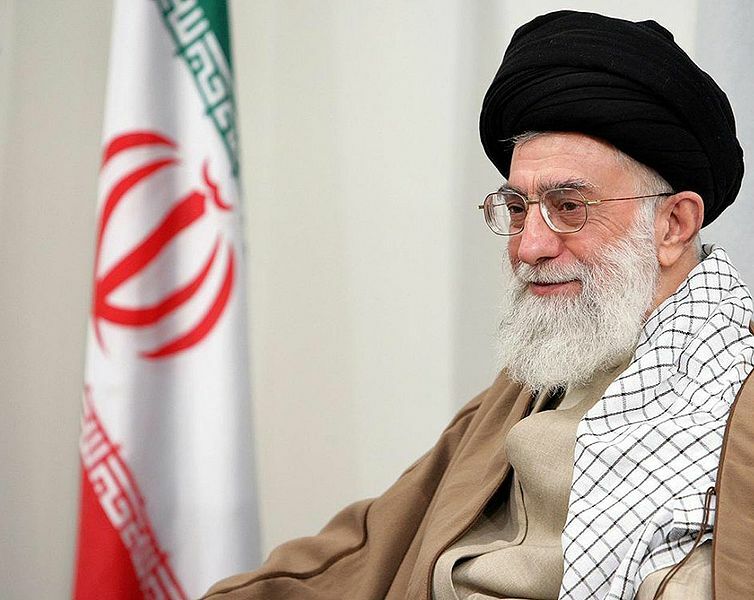 Grand Ayatollah Sayyid Ali Hoseyni Khamene’i born 17 July 1939), also known as Ali Khamenei, He has been Supreme Leader of Iran since 1989 and before that was president of Iran from 1981 to 1989. The supreme leader - the highest power in the land - appoints the head of the judiciary, military leaders, the head of radio and TV and Friday prayer leaders. Moreover, he selects six members of the Guardian Council, an influential body which has to pass all legislation and which can veto would-be election candidates. Ayatollah Ali Khamenei was appointed for life in June 1989, succeeding Ayatollah Khomeini, the founder of the Islamic republic. He served two consecutive terms as president in the 1980s. - He was elected by the Iranian people as the President during the 9th presidential election on June 24, 2005. - In the same career, he also held the position of managing director of Hamshahri newspaper and launched various affiliated periodicals including Neighborhood Hamshahri published and distributed in 22 areas of the city of Tehran, Hamshahri for Passengers, Diplomatic Hamshahri, Youth Hamshahri, Monthly Hamshahri and also extra pages attached to the Hamshahri newspaper for thinkers, students, etc. - Working as a member of the first central council of the Union of Islamic Associations of University and Higher Education Institutes in Iran. Known as Persia until 1935, Iran became an Islamic republic in 1979 after the ruling monarchy was overthrown and Shah Mohammad Reza PAHLAVI was forced into exile. Conservative clerical forces established a theocratic system of government with ultimate political authority vested in a learned religious scholar referred to commonly as the Supreme Leader who, according to the constitution, is accountable only to the Assembly of Experts. 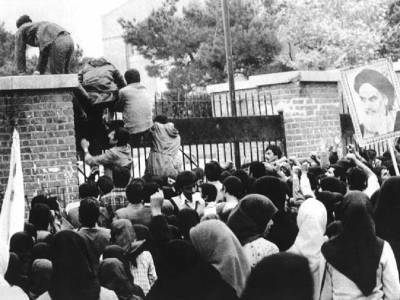 US-Iranian relations have been strained since a group of Iranian students seized the US Embassy in Tehran on 4 November 1979 and held it until 20 January 1981. During 1980-88, Iran fought a bloody, indecisive war with Iraq that eventually expanded into the Persian Gulf and led to clashes between US Navy and Iranian military forces between 1987 and 1988. Iran has been designated a state sponsor of terrorism for its activities in Lebanon and elsewhere in the world and remains subject to US, UN, and EU economic sanctions and export controls because of its continued involvement in terrorism and its nuclear weapons ambitions. Following the election of reformer Hojjat ol-Eslam Mohammad KHATAMI as president in 1997 and similarly a reformer Majles (parliament) in 2000, a campaign to foster political reform in response to popular dissatisfaction was initiated. The movement floundered as conservative politicians, through the control of unelected institutions, prevented reform measures from being enacted and increased repressive measures. Starting with nationwide municipal elections in 2003 and continuing through Majles elections in 2004, conservatives reestablished control over Iran's elected government institutions, which culminated with the August 2005 inauguration of hardliner Mahmud AHMADI-NEJAD as president. The UN Security Council has passed a number of resolutions (1696 in July 2006, 1737 in December 2006, 1747 in March 2007, 1803 in March 2008, and 1835 in September 2008) calling for Iran to suspend its uranium enrichment and reprocessing activities and comply with its IAEA obligations and responsibilities. Resolutions 1737, 1477, and 1803 subject a number of Iranian individuals and entities involved in Iran's nuclear and ballistic missile programs to sanctions. Additionally, several Iranian entities are subject to US sanctions under Executive Order 13382 designations for proliferation activities and EO 13224 designations for support of terrorism. Iran's economy is marked by an inefficient state sector, reliance on the oil sector, which provides the majority of government revenues, and statist policies, which create major distortions throughout the system. Most economic activity is controlled by the state. Private sector activity is typically limited to small-scale workshops, farming, and services. Price controls, subsidies, and other rigidities weigh down the economy, undermining the potential for private-sector-led growth. Significant informal market activity flourishes. The legislature recently passed President Mahmud AHMADI-NEJAD's bill to reduce subsidies, particularly on food and energy. The bill would phase out subsidies - which benefit Iran's upper and middle classes the most - over three to five years and replace them with cash payments to Iran's lower classes. This is the most extensive economic reform since the government elevated gasoline rationing in 2007. 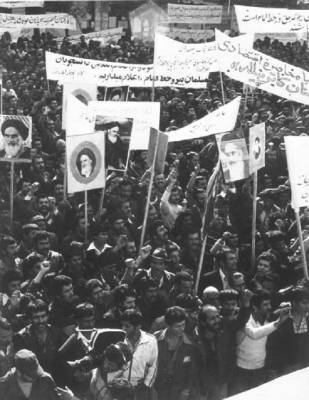 However, previous government-led efforts to reform subsidies - such as in the 1990s under former president Hashemi RAFSANJANI - were met with stiff resistance and violent protests. High oil prices in recent years allowed Iran to greatly increase its export earnings and amass nearly $100 billion in foreign exchange reserves. But with Iran's oil export price from March to December 2009 averaging just $55 per barrel and with a slight decline in oil production over the past four years, the Iranian government is facing budget constraints, and Iran's foreign exchange reserves dipped to $81 billion at the end of 2009. Tehran formulated its 2009 budget to anticipate lower oil prices and has reduced some spending. Although inflation has fallen substantially because of lower oil prices, Iran continues to suffer from double-digit unemployment and underemployment. Underemployment among Iran's educated youth has convinced many to seek jobs overseas, resulting in a significant "brain drain."